The charts reveal some astonishing facts. At the peak of the boom in 2006, over a third of all U.S. home purchase lending was made to people who already owned at least one house. In the four states with the most pronounced housing cycles, the investor share was nearly half—45 percent. Investor shares roughly doubled between 2000 and 2006. While some of these loans went to borrowers with “just” two homes, the increase in percentage terms is largest among those owning three or more properties. In 2006, Arizona, California, Florida, and Nevada investors owning three or more properties were responsible for nearly 20 percent of originations, almost triple their share in 2000. This entry was posted in National, real estate, Tom's Corner and tagged Housing Statistics, Residential Real Estate, Speculation on December 6, 2011 by Tom Brander. The survey projects expectations for the 2nd quarter of 2011. The scale ranges from 0-100 with 0 being much worse, 100 being much better, and 50 indicating no change expected. 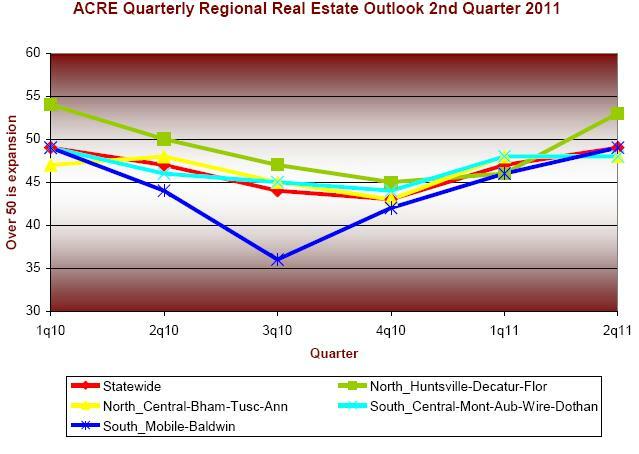 Spring is on the way and the Alabama real estate community is optimistic about sales. The sales index is at it highest level since we started the survey a bit over a year ago. While much of this is seasonal, sales expectations for the upcoming 2nd quarter was 60 compared to last years’ at 56. It is a welcome sign of a market showing improvement. The “overall” index (which includes National expectations) remains below the 50 mark at 49, which indicates slightly unfavorable expectations, the State score at 57 and local sales score of 60 were both improved from last quarter so a real trend seems to have begun. Inventory and prices are still expected to be troubled but the expectation there is also improving, every level is better than last year at this time. The only index to show modest decline on a quarter to quarter basis is the availability of credit at 41 this quarter vs. 42 last quarter. Expectations for Alabama (green in the above chart) are up from 55 last quarter to 57 this quarter. 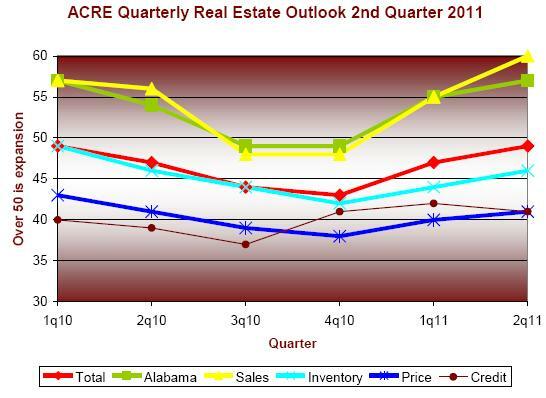 This score indicates favorable expectations for the overall Alabama Real Estate market. The overall (residential & commercial combined) confidence level was improved from the survey results for the last quarter. The statewide overall score improved modestly from 47 to 49 (see red line above), in short, while sales are expected to improve, the inventory, price and credit indications are still below the 50 mark. Sales will be up, but sellers are likely to be frustrated by competition and pricing and some buyers will continue to have problems getting financing. The coastal areas continued on an upward trend (see blue line below). The coastal overall score jumped from 48 to 49 which indicates a neutral market view. Sales expectations however were up to 61 while Alabama economic conditions are scored at 57, a level indicating improvement. The expectations for the state (total (red) in the chart above) are ranked at 49 up from 47 last quarter, indicating that respondents expect real estate conditions statewide to remain about the same as in the prior quarter. This reflects the tension between buyers and sellers. Perhaps more important than the absolute number is the fairly dramatic change in direction expressed across each of the measured questions with all measures showing improvement for two quarters now, and a reversal of the downtrend in evidence from when the survey began in the 1st quarter of 2010. All of the point values can be seen in the table at the end of this report. Commercial market participants were slightly more positive in their outlook this quarter than last at 51 this quarter vs. 50 last for overall and up to 58 for sales expectations. Price expectations remain weak, at 44 indicating continued pricing pressure in all markets. The rating for credit availability remains poor, at 47 down 3 points from last quarter, a level which indicates expected contraction in credit availability. North Alabama continues to have strong scores relative to the rest of the state. This quarter the expectations improved quite a bit. The total score of 53 indicates a consensus for national improvement in coming quarter. The outlook for the Alabama market is comparatively high at 64. Market participants are more positive on the sales outlook for the 2nd quarter than they were for the 1st at 64 this quarter vs. 55 last. Inventory is expected to remain with a score of 51. The price score is approaching neutral at 47. The North Central Region along with the South Central Region showed the least change of the states’ four geographic areas. The sales score improved 2 points to 58. Inventory, pricing and credit are all still below the 50 mark at 45, 39 and 41 respectively. The South Central Region participants outlook for sales improved 3 points to 58. The Southern Region continues to improve in its sales score up 5 points to 61 close to the Northern region as the most optimistic sales area. Close to 700 professionals responded to the 2nd quarter 2011 survey which was conducted during the month of March 2011. The survey, conducted by the Alabama Center For Real Estate now has the largest participation of any Real Estate Survey it provides important market insights. This entry was posted in Alabama Real Estate Confidence Index, Baldwin, Inventory, Jefferson County, MLS, Montgomery, National, North Alabama, real estate and tagged Alabama, Business and Economy, Housing Statistics, Multiple Listing Service, Quarterly Survey, real estate on April 12, 2011 by Tom Brander. Brookings – Quality. Independence. Impact. 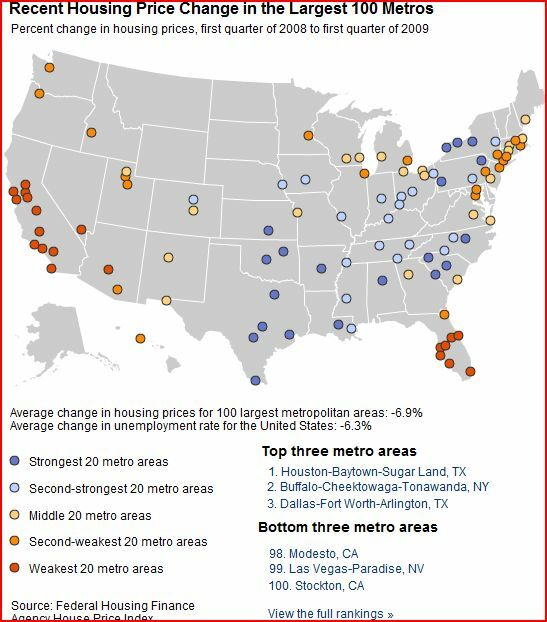 This Brookings study/map shows Birmingham as one of the 20 strongest housing price markets in the US! This entry was posted in Alabama, Birmingham, Home values, Jefferson County, National, real estate and tagged Alabama, Birmingham, Home values, Residential Real Estate on June 22, 2009 by Tom Brander. The single biggest question on most our readers’ minds is: Where is the housing market headed? I have attempted to put thoughts to paper only to be overtaken by the constantly shifting market. One of my favorite fellow blog sites has come out with a very compete analysis. I’ve included the 1st part here so click over to Calculated Risk and take a read, you will be way better informed for doing so. It will also help to understand some of the stats I produce and how to interpret them, particularly the tension between the new and used housing sectors and their relationship. Reuters is quoting Freddie Mac chief economist Frank Nothaft as saying that he believes U.S. housing sales are near a bottom. Nothaft also said about one-third of all sales were foreclosure resales. I disagree with Nothaft’s forecast. # New home sales are at or near a bottom. # Existing home sales will fall further. Since there are far more existing home sales than new home sales, I expect that total sales activity will decline further. via Calculated Risk: Housing Activity Forecast. This entry was posted in Building Permit, Construction, Foreclosure, National, real estate and tagged Existing Home Sales, Housing Statistics, National Housing News, New home sales, Residential Real Estate on April 19, 2009 by Tom Brander. I don’t often time republish stuff but this was too good, and I wanted my regular readers to have a look at it! Click the link for the whole paper, it is worth it. I know, I know: everybody is sick of hearing about those AIG bonuses. But bear with me for one more blog post, because I think the swell of populist anger can actually illuminate something interesting about the human response to inequality. Consider the ultimatum game, that simple economic task where one person (the proposer) is given ten dollars and told to share it with another person (the responder). The proposer can divide the money however they like, but if the responder rejects the offer then both players end up with nothing. via AIG and Inequality : The Frontal Cortex. This entry was posted in Bailout, National, Tom's Corner and tagged AIG, Bailout, Tom's Corner on March 23, 2009 by Tom Brander. From Our Friends at Caculated risk, Click to get the whole article and charts. I know many of our clients have C&D loans so I felt you should take a look at this. Banks in the United States face a new source of write-downs and failures in the coming year, as loans made to developers to finance residential and commercial property development rapidly go bad. Called acquisition, construction and development, or ADC, loans, they total 8.4 percent of all bank loans, just below a 30-year peak, and are used by developers to buy land, put in infrastructure and construct housing or commercial space. …..Of particular concern is that ADC loans are concentrated in smaller banks, which tend to have deep ties to local developers. ADC loans account for 47 percent of nonperforming loans at small banks, compared with 14 percent at larger banks. This entry was posted in Banks, Construction, National and tagged acquisition construction and development, Banks, National Housing News, Real Estate Market, Statistics on March 11, 2009 by Tom Brander.